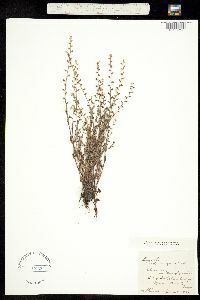 Annual herb 5 - 40 cm tall Stem: erect and upright, usually unbranched below inflorescence, slender, more or less straight, covered with rough hairs or coarse, stiff, appressed hairs. 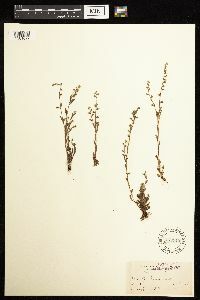 Leaves: alternate, stalkless (except for lowest), 1 - 5 cm long, 0.2 - 1 cm wide, lowest ones inversely lance-shaped, others oblong or narrowly elliptic, mostly with blunt tips, and covered with appressed, stiff hairs. Inflorescence: one to few, terminal, less that half the entire plant length, more or less bractless (sometimes leafy bracts near very base), erect, rough-hairy or coarsely stiff appressed-hairy, spike-like, with short-stalked flowers spaced about 0.5 - 2 cm apart. 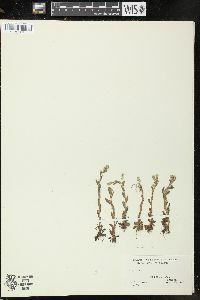 Flowers: short-stalked, white, tiny (1 - 2 mm broad), radially symmetric, funnel-shaped with well-developed tube and shorter, erect to ascending, rounded lobes. 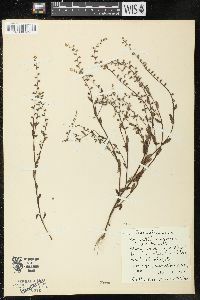 The erect, short (1 - 5 mm) flower stalks are shorter than the sepals, and covered with long, sharp, spreading hairs and shorter curved or hooked hairs. 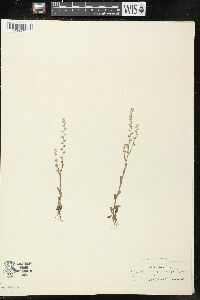 Sepals: five, but fused for up to half their length, then separating into five, unequal length (appearing two-lipped), lance-shaped lobes with pointed tips. The calyx as a whole is 4 - 7 mm long, but the two lower sepal lobes are conspicuously longer than the upper three, and the fused portion has spreading and often curved or sometimes hooked hairs, while the lobes typically have coarse, stiff, appressed hairs. Petals: five, but fused for over two-third their length into a long tube, then separating into five, short, rounded, erect to ascending lobes. At the base of the petal lobes, the throat of the petal tube is blocked by five small projections or appendages (fornices). Stamens: five, attached to inside of petal tube by short filaments, the anthers not extending past the petal tube. Pistil: with one, deeply four-lobed, superior ovary; one, short (shorter than nutlets), inconspicuous style; and one, unlobed stigma. Fruit: a cluster of four, fairly erect, shiny, greenish black to black, smooth, 1.2 - 1.5 mm long, 1.1 - 1.2 mm wide, compressed or somewhat flattened lengthwise, somewhat inversely egg-shaped nutlets with narrowed base and a prominent lateral ridge running around the edge of the flattened faces. The nutlet clusters are enclosed by the two-lipped erect sepal lobes, and held on erect, short stalks (shorter than sepals). 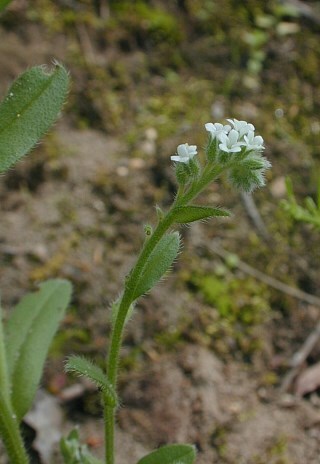 Similar species: Myosotis verna is most similar to M. macrosperma, a more southern species that is sometimes considered a variety of this species. It differs by having the fruit stalks diverging and further spaced apart (often more than 2 cm between flowers), and the nutlets tend to be a bit larger (1.4 - 2.2 mm long). 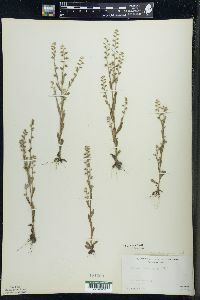 Also similar are M. stricta and M. discolor, except both those species have sepal lobes of more equal length, bluish flowers, and the nutlets are narrower (under 1 mm). 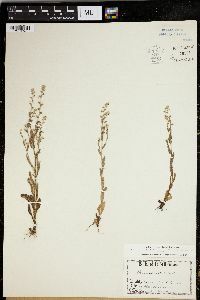 Other members of the genus in our area have flower stalks that are longer than the sepals, and the flowers are typically wider with spreading lobes. Habitat and ecology: Occasional, preferring dry soil, localized to sterile, bare areas of woodlands, disturbed sandy soil, and also shaded grassy places. Notes: This species is sometimes found as a weed in nursery plots. 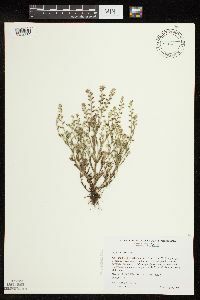 An infrequent plant in the northern and southern parts of the state. There are no records from the area about Lake Michigan or from the central part of the Tipton Till Plain. It is generally found in open places in noncalcareous soils. 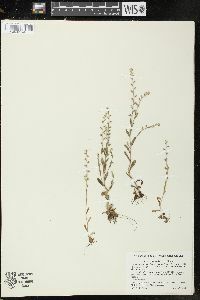 In the northern part it is found in bare spots on the crests and slopes of black oak ridges; on lower ground, it is usually found in depressions in sandy soil in open places in black and white oak woods, generally associated with Gaylussacia baccata, Vaccinium vacillans, Houstonia longifolia, etc., and more rarely found along railroads and roadsides. 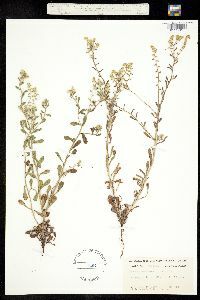 In the southern part of the state it is most commonly found in white clay soil in fallow fields, where it is sometimes abundant, associated with Alopecurus caroliniana, Callitriche Austini, Arabis virginica, and Poa Chapmaniana. It is also found in bare places in low, flat, post oak woods and in bare places on the crests of black and white oak ridges.